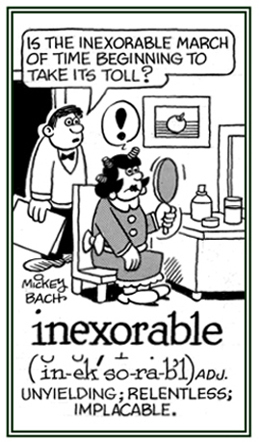 Not exhalable; that which cannot be exhaled or evaporated. 1. Descriptive of something that is impossible to stop or to prevent: When people get older, it is inexorable or inevitable that they will not have the same energy and capabilities as they did when they were younger. 2. A reference to a person who is adamant and pitiless; unyielding: Mildred was someone who was quite stubborn and inexorable, and not moved by anyone's attempts to plead or have her change her mind. © ALL rights are reserved. Not capable of being passed over; insuperable; insurmountable. 1. Something that is quickly and easily set on fire and burned. 2. Capable of being set on fire; combustible; flammable. 3. Easily aroused or excited, as to passion or anger; irascible: "Her father had an inflammable disposition regarding the men she was dating." A reference to someone or a condition that is not to be feared or dreaded: The residence where Sally and her family lived was a result of having good informidable neighbors. Not frustrable; that which cannot be frustrated or rendered ineffectual. Tasteless; insipid; bland and without flavor. Showing page 21 out of 43 pages of 633 main-word entries or main-word-entry groups.